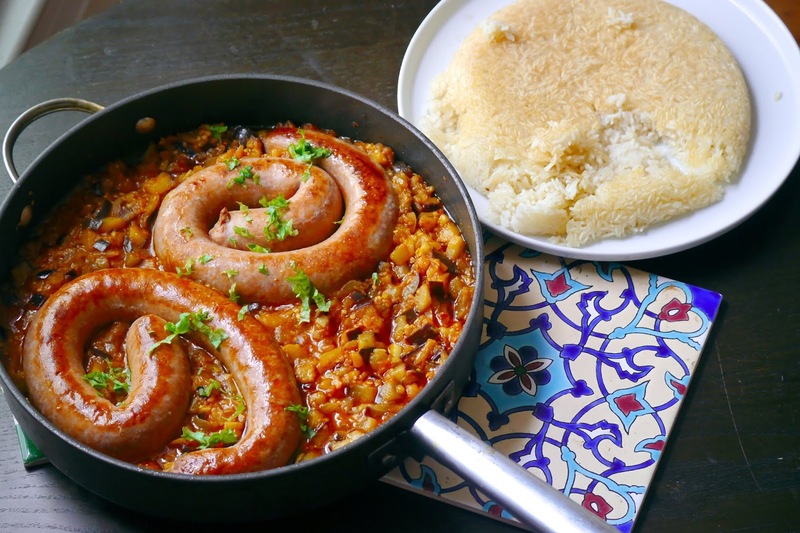 Persian eggplant stew (i.e. KhoreshBademjan) has invariably been the most viewed English post from blog’s archive. Based on my longer than a decade experience, as a Persian transplant in West, the most highly praised Persian food by the Western palate is indeed eggplant stew. Considering such merit, presented here is a quick style of Persiam eggplant stew, made with Italian sausage and sun-dried tomatoes. The flavor profile is heavily influenced by the Italian cuisine; such that, one might omit the saffron and brand their culinary creations as an Italian sausage stew. Note: the recipe does not ask for garlic, as the original Persian stew does not ask for it. In a large deep skillet pan brown the sausages and set aside. To the same pan, add the onions and lightly caramelize on medium low heat. Add the eggplant cubes and cook until soft and translucent. Add the turmeric, chili powder, and tomato paste and toast in the oil. Return the sausages, sour orange juice, and chopped sun-dried tomatoes. Add enough of the stock to barely cover the sausage links (the amount provided by the recipe should suffice). 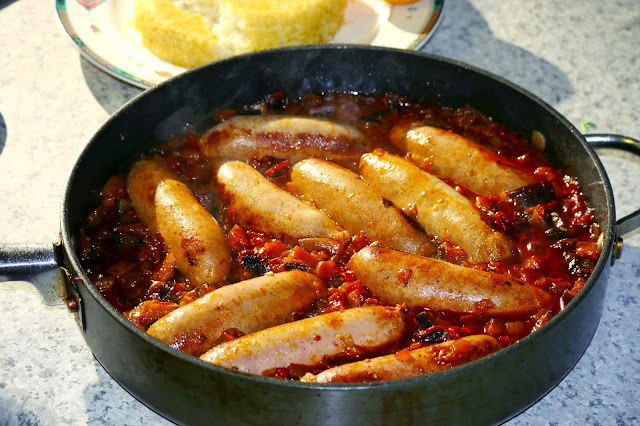 Cook, uncovered, until the sausages are cooked through and the stew is thick. Sprinkle with saffron before serving. 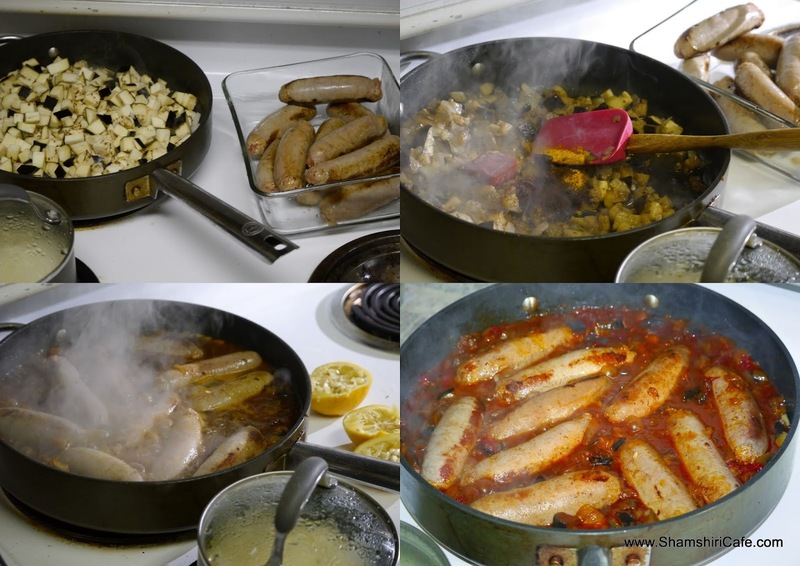 The fennel spice, used in the sausage, matches well with the overall flavor profile of the stew. Substituting the sausage with milder versions is, thereby, not recommended.